Feeling a little bored one day and wanted to see what the "back of Bourke" is all about, I bought an overnight ticket on the Indian Pacific train headed out of Sydney to Broken Hill. 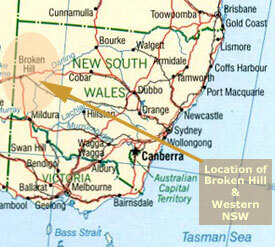 OK, first of all, it is further to Broken Hill than you might think. Sydney and Broken Hill are technically in the same state (New South Wales), but once you arrive in Broken Hill, the real differences become clear quick. First off, the word here is "dry." Think desert. 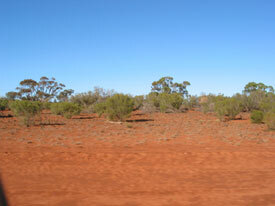 Empty expanses of land run to the horizon, interrupted by dry grass and the occasional scrubby tree. 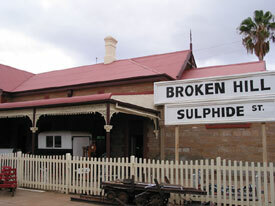 To me, Broken Hill is the beginning of the Outback, in all of its mythical glory (much of it well deserved). The other thing you notice in Broken Hill is that everything is slightly off. Such as the time, which is a half-hour behind Sydney. Not a full hour, a half-hour. And the way the town is laid out, where 2/3rd of it is on the north side of the hill, and the remainder is on the south side. While I was in Broken Hill, I walked all around the entire town (a few times over), taking in the interesting architecture and the friendly locals. I also went on a rural mail run, a 550+ kilometer trip in one day, meeting locals and taking in the big empty. This is the old Broken Hill train station, which is now a fabulous museum staffed by extremely nice retired folks more than eager to tell you about the days of steam locos and real bush rangers. 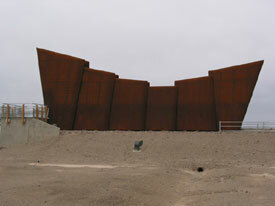 The structure on the left is the Line of Lode Miners Memorial, and on the right is the Visitors Centre. It is hard to talk about Broken Hill without mentioning mining, which is the reason the town was founded and still survives today. You can see how mining was done here. 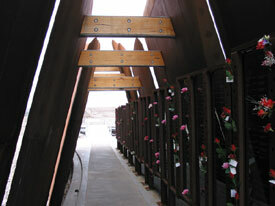 This is the Line of Lode Miners Memorial from the side. The rusted appearance was apparently done on purpose, because the memorial itself was only unveiled in 2001 and is pretty new (as memorials go). Quite a few miners died working for various mining companies in this area, and the memorial is supposed to show the nation's appreciation. Inside the Miners Memorial, you can see a long wall running the length of the structure, enscribed with the names of every miner to die on the job in this area. The cause of death for each miner is given, and they range from the gruesome (lead dust poisoning) to the mundane (heart attack). 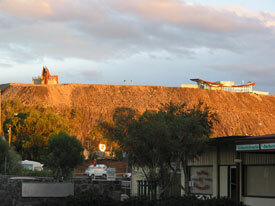 The names lead up to the present day, because mining is still being done in the area. 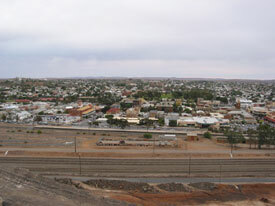 The hill in Broken Hill dominates the town and acts as its (ugly but overpowering) center. This is the view from the top of the hill down onto the north side of town. You can't talk about Broken Hill and mining without talking about the unions. Many important miners union meetings took place in the Trades Hall, and this place was a hotbed of activity during the long industrial actions, such as the 18 month strike in the early-1900s. 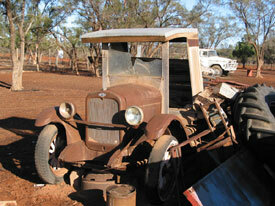 I shot this Rolls at the Pro Hart gallery, which is at the northern edge of Broken Hill. 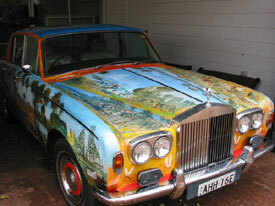 Yes, the entire car is covered with paintings, which cover Australian history from invasion to today. Pro Hart is a sorta freaky guy. I mean, he signs his artwork with his DNA, so you can make sure it is an original piece. 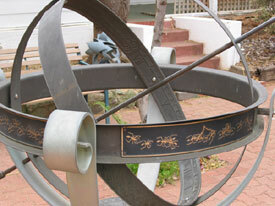 Pro Hart collects quite a few different esoteric things, from antique baby rattles to sundials. He also has a very distinctive style, which centers on a few key elements, like ants or figures in masks, and carries them through to different types of art in various mediums. A lot of this stuff reminded me of my buddy Dave Hanson. 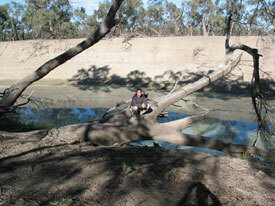 I'm standing on an old tree, beside the Darling River, halfway through the long rural mail route. 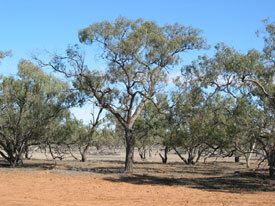 Oh, and this is a tree in the outback. 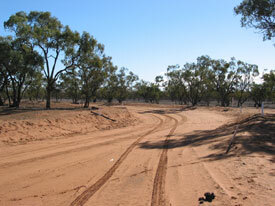 And this is a road in the outback. If anyone reading this is interested in the Bush Mail Run mail tour, call Steve Green at 0411 102 339 or email greenhil@bigpond.net.au and he will hook you up. I took the tour in mid-2002 when it was run by Steve Lee, and I heard from the new owner of it, Steve Lee, via email in August 2004, and the Bush Mail Run is still going strong. They hit some new stops now, including an organic farm near the Darling River. Also, Steve Lee says they have a new 4wd truck. Definitely give him a call if you want to take the tour. I recommend it highly! 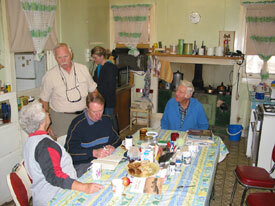 Part of the Bush Mail Run stops at the house of an outback family, where you have morning tea in their kitchen. These folks (sitting at either end of the table) were super-hospitable and friendly to us. It might have something to do with the fact that their nearest neighbors are a half-hour away. This is really the place where those satellite phones make the most sense. An old Chevy car (early 1920s) sitting out in their front yard. The part I loved most about this car is that 1) it was running until recently and 2) it has wooden tire rims. Good enough for the wagon, good enough for the car, I guess. 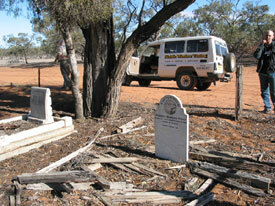 Steve Lee outside his Bush Mail Run truck pondering an old outback cemetery. Many of the graves in this cemetery are for people buried in the late-1800s. 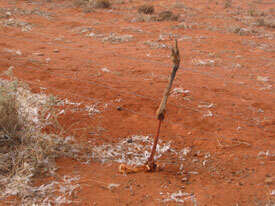 All that is left of an emu, which got caught in a fence. Emus are incredibly stupid animals. When they are running across fields, they will smack directly into a fence, never even attempting to jump over it. We saw several scenes like this on the trip. The outback from the back of Steve's truck at full speed. The Australian red center starts around here, and the dust gets all over everything. As I said earlier, quite a few things in Broken Hill just seem a bit off. Call it the quirky byproduct of living on the edge of civilization. This memorial to the band members that played while the Titanic was sinking is a perfect example. 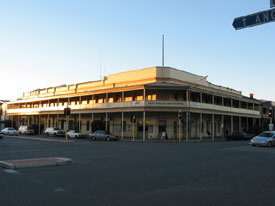 Around the first few decades of the 20th century, Broken Hill had no fewer than 4 bands that would play for different events. 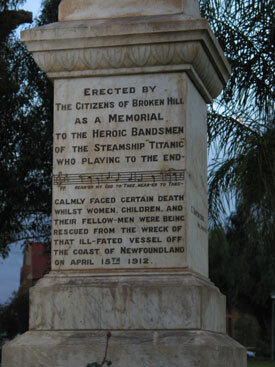 The bands were such an integral part of life in the Broken Hill community that the actions of the band on the Titanic seemed almost saint-like to them. I really liked the architecture in Broken Hill because they went out of their way to dress up what could be a pretty trashy way of building things. For example, even though corrugated iron is used extensively for roofs, they built them at nice angles and always painted them. Even the most mundane rails are ornately decorated. 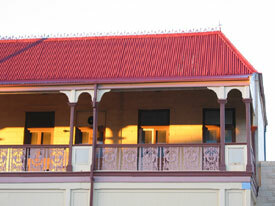 The West Darling Motor Hotel. I had a few good $7 meals there, and you can beat the conversation at the bar, whether the topic of the day is the AFL or how you can buy a house in Broken Hill for $7000. 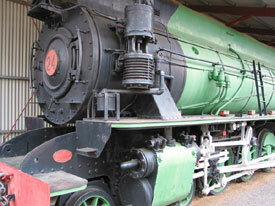 The last steam locomotive that ran the Silverton - Broken Hill route. 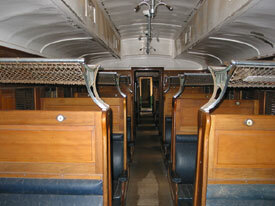 This railroad carriage, from the late-1800s, has been remarkably preserved at the railroad museum. All credit goes to the dry weather and the dedicated volunteers that kept this train from going to the scrapyards. 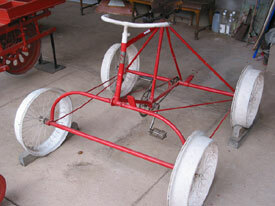 This bicycle has been specially adapted to fit the narrow gauge railway line that runs from Silverton to Broken Hill. 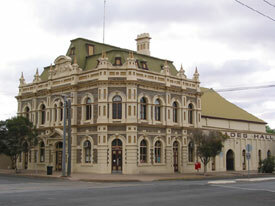 I bid farewall to Broken Hill and took the train on to Adelaide, South Australia. I figured was already in the time zone, so why not? 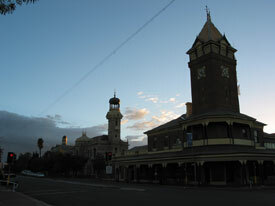 This picture shows the town clocktower hiding a glorious outback sunset.